Barati's music sounds typically 1960s modernist. Textures are masterly. Dissonance is employed. If you take the thornier moments from Malcolm Arnold's Seventh and Ninth symphonies and imagine them without the communicative lyricism then you have a fair approximation of Barati. Similar parallels can be found with Humphrey Searle. 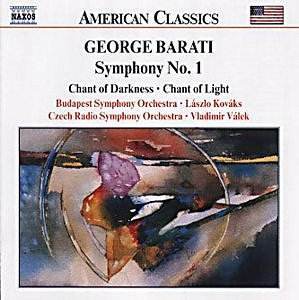 His countryman, Bartók, might well be seen as a point of departure for this music although Barati is far far tougher. He must have imbibed deeply of Roger Sessions' symphonies. The music of Sessions (with whom he studied) is denser than Barati's but Barati just as uninhibitedly ploughs his own furrow with no feints towards accessibility. In the symphony a wispy melancholy appears in the andantino tranquillo although this music is not tranquil. Barati deals in mood and atmospherics in the outer movements and they certainly ripple with incident but symphonic direction is not obvious. The two Chants date from thirty years after the symphony. While the symphony is something of a 1960s museum piece the Chants seem to have more to say. Both were prompted by the devastating death through breast cancer of his daughter Lorna at the age of 39. That was in 1992. The Chants have the bearing of 19th century tone poems (and the titles could easily have been those of unknown works by Glazunov) though the idiom is determinedly 20th century. The constructional 'bricks' include tiny cells, instrumental lucidity, an aversion from tunes (though one of some nobility emerges at 11.37 in Chant of Light), clarity, pecking activity, clattering and tinkling percussion. If Chant of Light is designed to provide a foil to Chant of Darkness (the latter written in the immediacy of bereavement) then the light is aspired to through darkness. Those realms are further recreated through the Chant of Darkness which was written, contrary to his usual method, straight into full score. The slow-motion 'lightning strikes' (11.30) of the massed violins add a protesting voice to the nerveless propulsion through a kingdom Barati had no wish to explore but through which he was impelled by grief and anger. Paul Horsley contributes truly valuable notes and, unlike the Naxos Barber English-only series, are also in German, Spanish and French. Mr Horsley reminds us that Barati was one of many Hungarians who have contributed to world, and especially US, culture with a value and éclat out of all proportion to his birth-country's minuscule population (only 10 million people). Barati fled his homeland during the 1930s having studied with Leo Weiner and with Kodaly. He studied in the States with Sessions at Princeton and became a US citizen in 1944. He played cello under Monteux at the San Francisco Symphony, then from 1950 to 1968 was principal conductor of the Honolulu S.O. He died in 1996 following a still unsolved street crime in Los Gatos where he was struck severely on the head. He died 11 days later. His wife, Ruth, whose effort and support brought this recording into existence, died in 1999. The orchestras are never less than good and the acoustics allow every detail to register. By a small edge the superior tracks are those from the Czech orchestra and Válek; these are also the more impressive works. Barati is here the unrepentant, even proud, exponent of modernism and his Chant of Darkness stands out as the most gripping work in this company. It is surely lit by a tragic compulsion that I did not sense in the other two works.